Create an Edge API proxy from an OpenAPI Specification. Call the API proxy using cURL. Add a policy to a conditional flow. Test the policy invocation using cURL. In this tutorial, you'll learn how to create an Edge API proxy from an OpenAPI Specification using the Apigee Edge management UI. When you call the API proxy with an HTTP client, such as cURL, the API proxy sends the request to the Apigee mock target service. An OpenAPI Specification uses a standard format to describe a RESTful API. Written in either JSON or YAML format, an OpenAPI Specification is machine readable, but is also easy for humans to read and understand. The specification describes such elements of an API as its base path, paths and verbs, headers, query parameters, operations, content types, response descriptions, and more. In addition, an OpenAPI Specification is commonly used to generate API documentation. The target service returns the greeting Hello, guest! An Apigee Edge account. If you don't have an account, you can sign up by following the instructions at Creating an Apigee Edge account. An OpenAPI Specification. In this tutorial, you'll use the mocktarget.yaml OpenAPI Specification which describes Apigee's mock target service, http://mocktarget.apigee.net. For more information, see https://github.com/apigee/api-platform-samples/tree/master/default-proxies/helloworld/openapi. cURL installed on your machine to make API calls from the command line; or a web browser. Click API Proxies in the main window. Alternatively, you can select Develop > API Proxies in the left navigation bar. In the Create Proxy wizard, select Reverse proxy (most common) and click Use OpenAPI. The Details page in the Create Proxy wizard displays. The fields are pre-populated using values defined in the OpenAPI Specification, as shown in the following figure. The following table describes the default values that are pre-populated using properties in the OpenAPI Specification. An excerpt of the OpenAPI Specification illustrating the properties used is shown following the table. The following provides an excerpt from the OpenAPI Specification showing the properties that are used to pre-populate the fields. Edit the Description field as follows: API proxy for the Apigee mock target service endpoint. On the Flows page, make sure all operations are selected. Tip: Conditional flows are generated automatically from the operations that are defined within the paths object in the OpenAPI Specification. Conditional flows tell Edge, "When you see this, perform this logic." For example, when an API call is a GET on the /xml resource (the condition), transform the response to JSON (through a policy attached to the conditional flow). Only one flow executes per transaction—the first flow whose condition evaluates to true. On the Security page, select Pass through (none) as the security option, and click Next. On the Virtual Hosts page, make sure all virtual hosts are selected and click Next. On the Build page, make sure the test environment is selected, and click Build and Deploy. On the Summary page, you see an acknowledgement that your new API proxy was created successfully and deployed to your test environment. Click Mock-Target-API to display the Overview page for the API proxy. Congratulations! You've created an API proxy from an OpenAPI Specification. Next you'll test it to see how it works. You can test your Mock-Target-API API using cURL or a web browser. In a terminal window, run the following cURL command. Substitute your organization name in the URL. Tip: You can also enter the URL in a web browser to get the same response. Way to go! You've built a simple API proxy from an OpenAPI Specification and tested it. Next, you'll add the XML to JSON policy to the View XML Response conditional flow that was generated automatically when you created the API proxy from the OpenAPI Specification. The policy will convert the target's XML response to a JSON response. First, call the API so that you can compare the results with those received after you add the policy. In a terminal window execute the following cURL command. You're calling the target service's /xml resource, which natively returns a simple block of XML. Substitute your organization name in the URL. Now let's do something that converts the XML response to JSON. 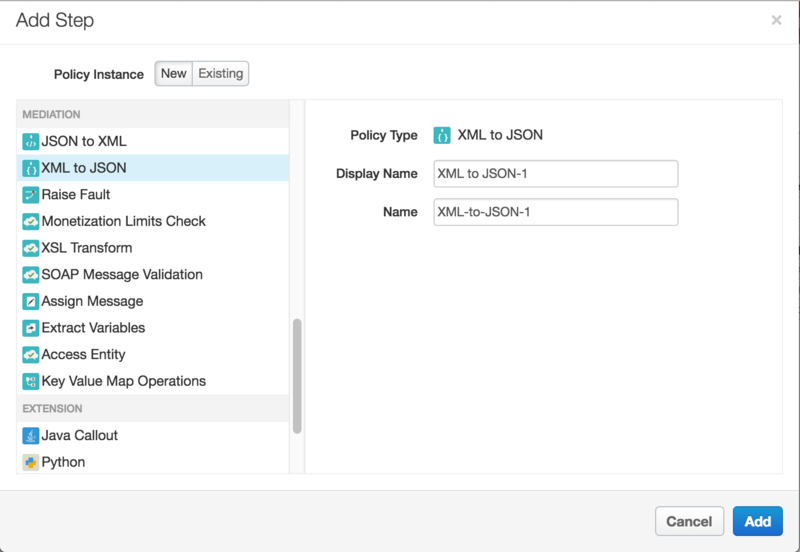 Add the XML to JSON policy to the View XML Response conditional flow in the API proxy. Click the Develop tab in the top right corner of the Mock-Target-API Overview page in the Edge Management UI. In the left Navigator pane, under Proxy Endpoints > default, click the View XML Response conditional flow. Click the bottom +Step button, corresponding to the Response for the flow. The Add Step dialog opens to display a categorized list of all the policies that you can add. Scroll to the Mediation category and select XML to JSON. Keep the default values for Display Name and Name. Click Add. The XML to JSON policy is applied to the response. Congratulations! You have successfully tested the execution of a policy added to a conditional flow.